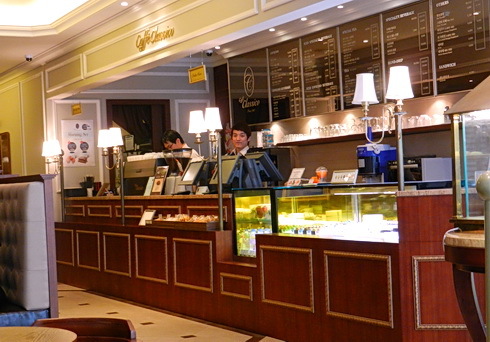 Popular European style bakery chain in South Korea, Paris Baguette Cafe. Changwon, South Korea 2011. Photo by HJEH Becker. Changwon has population of over 1 million. Romanticizing either one’s own culture or another culture, can be as simple as introducing a foreign food dish, which becomes wildly popular over time. Popular, because not only the dish tastes great, but the consumer purchases and enjoys the dish as partaking in a refined, higher class or more worldly expression of their personal taste. Before you jump on me for being critical or elitist, especially for preparing your treasured family heirloom recipes, sit down and have a café with me. Hear me out. 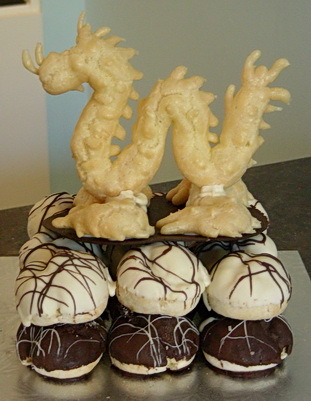 Traditional Asian cuisine is not known for baked elegant desserts at all. Whatever desserts offered now in Asian bakeries, are an influence of a country’s European colonial past (ie. egg tarts in Macau are a Portuguese legacy; Filipino pastries, a Spanish adaptation) or simply a local baker, restauranteur who loved European desserts and understood their patrons’ need to end a meal with a sweet, elegant flourish. Last autumn, Jack sampled both Asian street food and some gourmet European cake slices when he was in Taipei, Tawain and in South Korea on business trips. 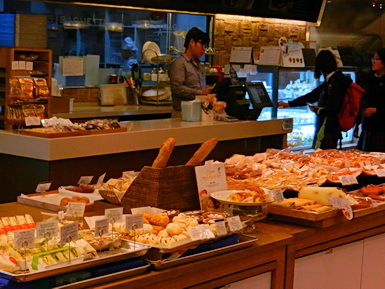 On both occasions, he found the bakery cafes when he wandered around in the cities’ core shopping areas. Petite four desserts with a coffee or tea. Strasbourg, France 2010. Photo by J. Chong. Little tartlets and squares with some made from marzipan (almond paste). The cakes were quite good which is a compliment from someone raised by a German mother. His mother loved preparing elegant multi-layered cake tortes, linzertorte (hazelnut tart with raspberry almond filling), plum kuchens and wonderful cookies by using traditional techniques. Not surprisingly his maternal line, has pastry chefs and restauranteurs back to the 1700’s. Over 25 years ago, the few Asian bakeries that I knew in Canadian Chinatowns, offered very limited desserts that were primarily egg or coconut tarts, buns filled with whipping crème, and savoury fillings such was ham, barbecued pork or even (gasp), wieners. The cake and bun crumb tended to be primarily sponge or chiffon cake-like textures –safe, bland, simple ingredients and not too sweet for Asian palates. Strangely, I never saw muffins nor pies in those bakeries at that time. German pastries at local outdoor farmers’ market. Freiburg, Germany 2010. Photo by J. Chong. 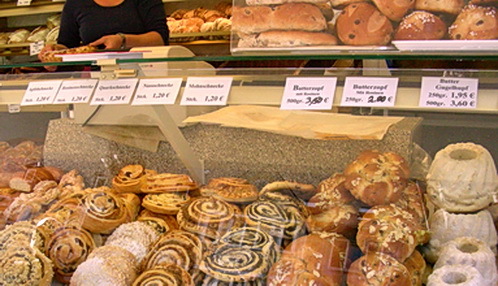 Not all are commonly found in North American bakeries but for local Germans are low-cost, but freshly baked dessert snacks. Now, in bigger Canadian cities, Vancouver and Toronto, there are more Asian bakeries and large Asian supermarkets that will offer a bit more –such as mousse cakes and fruit tartlets along side the egg custard tarts and savoury buns. I’m not sure how many have jumped onto the phyllo pastry bandwagon but it’s just a matter of time: phyllo pastry is so easy to work with and bakes quickly. The greatest compliment for adopting a foreign dish, occurs when a chef or baker embraces traditional techniques, transforms the dish into several different unique variations and creates a business that garners fans. Ganache Patisserie, a gourmet cake bakery café in the hip Yaletown, Vancouver BC offers walk-in customers a fabulous range of different elegant cake slices and if needed, customized wedding cakes. 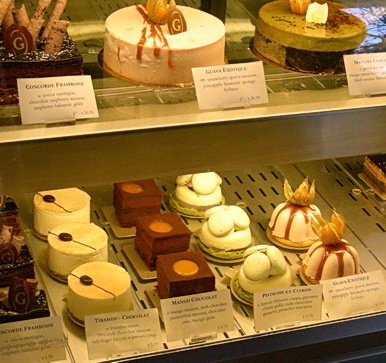 The pastry chef is Henry Hwang who picked up his skills in France. 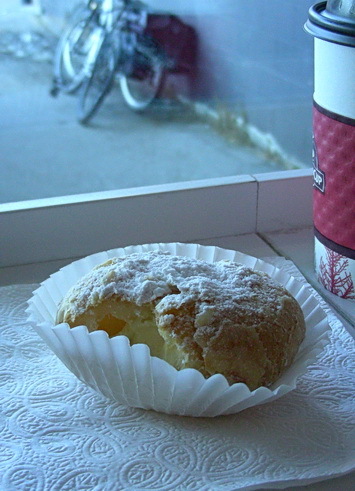 Mango creme puff, one of several flavours at Cruffs. Calgary AB 2011. Photo by J. Chong. Bakery was started up by 2 brothers from Indonesia where the pastry chef previously ran a bakery for 4 yrs. Meanwhile in prairie city of Calgary, brothers Mario and Ignas Adiwibawa from Indonesia, launched their crème puff bakery , Cruffs two years ago in the trendy Mission area. Mario, the baker added more baking skills to his culinary arsenal after attending a culinary school in Vancouver. Previously he ran a bakery for 4 years in Indonesia. They offer their crème puffs with choice fillings which include: Irish Crème Baileys, pistachio, hazelnut chocolate, mango, lemon and green tea. Recently they offered a blueberry creme puff. In 2012 they are venturing into a version of an Indonesian pastry, roti, a Dutch colonial by product. Their Indonesian coffee based roti, will be rebranded with a different name to avoid confusion with Caribbean and South Asian spicy curry savoury rotis stuffed with sauce, veggies or meat. For those whose cultural heritage includes these fine dessert inspirations, it is simply a wonderful memory and casual touchstone to enjoy a dessert well executed even if the chef came from a country located far from the dessert’s origins. Stay tuned for romanticizing a culture feature of the East by the West. I lived in France last year and I am know living in South Korea, and although bakery’s like Pairs Baguette are all over the place in Korea the goods that they sell are not even in and same league. Stoddart34, my partner did try Paris Baguette and certainly would agree with you. He was more pleasantly surprised by the other more “high end” gourmet bakery-cafes of which a different photo is featured in my blog post. Keep in mind, my partner and his family are from/some still based in southern Germany –just 30 kms. from the French border. Not far from Strasbourg. The baking techniques and desserts in southwestern Germany are more delicate and closer to French. As I said delicate hand in use of sugar, finer crumb cakes, multi-layered tortes, mousse fillings, buttercream and puff pastry (which there is a German equivalent word). I trust my partner’s judgement: his mother was formerly schooled in fine baking before WWII/immigrating to Canada. She knew how to make puff pastry from scratch! His childhood and onward is filled of watching his mother and eating her creations…nearly weekly. I hope you enjoy your stay in South Korea. He enjoyed walking /cycling the formerly buried stream area. He also stumbled into the meat market….thankfully it didn’t totally shock him. It’s not something we have in North America on a larger scale. I love seeing European and American dishes interpreted through the lens of other cultures. Here in Fairbanks we have TONS of Thai restaurants and I know that some of the Thai cooks have remarked that the food they serve is interpreted to varying degrees to suit the tastes of Americans (which I really wish they would do less often), so I’m always looking for ways in which other cultures might be interpreting the food I’m most familiar with in order to share it with their countrymen and women. Vancouver looks like such a fun place to eat! If you want to try a wide interpetation of different Asian cuisines, VAncouver is the place since it also is close to fresh seafood sources. I did eat at a Chinese restaurant in the Canadian Arctic, in Iqualuit on Baffin Island. The dish was fine (a soy black bean seafood dish) though I suspect the seafood I had was frozen and shipped north. Presumably the Thai restaurants in your end of Alaska might tone down the spiciness or interplay of sour-hot-spicy in certain soups. On TV in the past, watching the Japanese Iron Chef and seeing how the Asian chefs did or did not successfully transform European techniques /dishes was interesting. It became very noticeable which Asian chefs had formal European culinary training vs. others who didn’t seem as well versed. I’m drooling most on the “Mango creme puff” Ms. Jean! I’m not much of a sweet tooth but I love your all your pictures. Definitely tuning in for the second part of this post. Happy weekend! You would like the mango creme puff –very light and not too sweet. As for part 2 on the West romanticizing about the East, stay posted for awhile. I have other stuff lined up too! How interesting and fun! I love different cultures and foods. I lived in Sicily and (at least then) only ate Italian foods – I saw no other foods available in restaurants or shops! Some of the best I’ve ever had…but it’s nice to have a variety! A well-made egg tart is lovely. However if you only like egg tart, you’re missing a whole dimension of pastries. In Montreal, I came across a wonderful piece of dessert called the moon cake which was being sold along with jasmine tea at the Chinese Lantern Festival in the Botanical Garden. Is it actually Chinese or is it a variation. I haven’t seen it anywhere else since. Oh I didn’t know it was based on a festival. In India maybe in the north east there might be moon cake. I meant I didn’t come across it in Thailand, Indonesia or Singapore. Maybe because I wasn’t there during autumn. P.S: I love your fish. Its a wonder they are not fat yet. I agree with you completely. Here in Thailand, there are A LOT of bakeries, but not all of the cakes and such have the same taste. In fact, it’s a common complaint from foreigners that this bread or that cake doesn’t taste good. 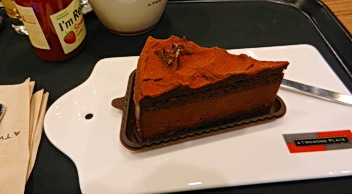 Brownies are often chocolate cake. Some of this is because of the ingredients used – butter substitute. Ovens are not in homes so the fact that so many shops and street vendors bake, really says something about the craze. That being said, there are good bakers and I feel like when I lived in Chiang Mai, there were some exceptional ones. Of course, one of them was a Frenchman with his Thai wife. But there are good Thai bakers who have invested in full ovens (not the mini ones that are more popular and affordable – I have one), and search for recipes online, and don’t mind trial and error. Yeah, great post. Very astute of you all, too. I often think of the coffee craze here, but not the baked goods and Western style cakes and brownies (cookies are not as popular). I appreciate your insights about living in Thailand as an American. I’ve learned much through your blog. I guess there aren’t enough dairy cows in Thailand to provide ready supply of butter. I reread my blog post since it’s been awhile and was struck how true it still is. I also realized I better make true to my promise on a blog post of the West romanticizing something from the East. Weird sushi? Climbing Mt. Everest as a top adventure must? I actually love baking. It was something that I could call my own since my mom is such an amazing cook. So, I can’t say I’m an expert, but I’ve baked my handsome share of cookies…I own an oven here and I certainly have a strong opinion about what I like. It’s funny – Thai food is sweet, but their traditional desserts are not. Crepe cakes are actually popular here, but good tasting ones are hard to find. Frostings are almost non-existent or over the top yucky. Crepe cakes? Explain more about this. Jack is a real pro in making super thin French crepes. Yes, he uses real butter. He can make a pile of 20 in 1 hr. and they are perfectly thin and not burnt. Yumm and we usually have it with his fresh fruit homemade compote. (any combination of berries –blackberries, raspberries, plums, etc. Are these fruit found at all in Thailand?? We take them for granted in North America.) As a nice touch it’s white wine flavoured whipping cream on top. Just toss in a tiny wine cap amount near the end of beating the whipping cream. I used to bake abit more. But it tended to be for family parties or for friends. Now the only thing I do is baking savoury and dessert focaccia from scratch. An idea…especially with all the fruits in Thailand. I’ll give you the link to my inspiration. https://cyclewriteblog.wordpress.com/2011/06/20/kicking-up-schiacciata-con-l%e2%80%99uva-grape-focaccia-my-way-with-ginger-root-and-spices/ The dough is basic Italian-like: just flour, pinch of salt, yeast and water. No eggs, butter nor sugar. Crepe making is an art form, eh? My friend Clint, his aunt made wonderful crepes. She collected all these cast iron kitchen ware and it was fun to watch her make them – and delicious! Thailand grows strawberries, but not the other kind. We have them frozen though or canned. Baking bread from scratch! Now that’s not easy. I don’t have the counter space for that, but I’ll figure something out 🙂 Thanks for the recipe. Wonderful assessment, and I think it still holds true. When I was in Taipei, the cakes were lovely and varied, a bit daring even, with the exotic fruits taking the place of orange and raspberry. In Japan, it’s all chiffon and phyllo, two flavors my partner detests, which means we’re not eating much cake in this house, haha. 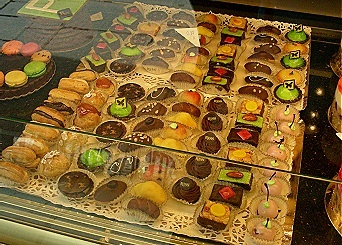 My personal favorite is marzipan-based anything, so I would be quite happy and fat in that petite fours cafe in France! Chiffon and phyllo –all light textures/flavours very typical preferences for those raised on Asian cuisine since dessert has not been traditionally a star dish. Chiffon is boring but I like phyllo. I’ve worked with phyllo for making strudel (a long time ago). Yes, marzipan with its almond dominance would be fattening. But still lovely as a base or part of a dessert.